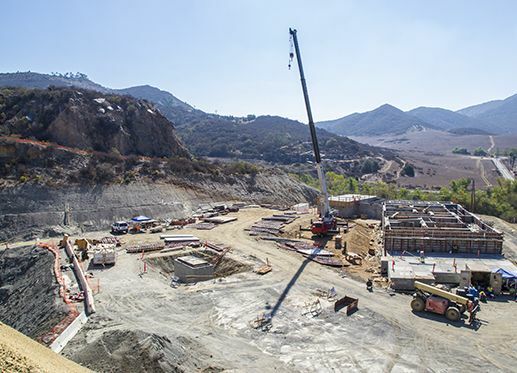 Plant is designed for an average daily flow of 541,000 gallons per day and will treat domestic watewater generated at the Harmony Grove Village development. The plant will provide secondary and tertiary treatment of domestic wastewater. Primary treatment processes at the plant will consist of a rotating drum screen, a bypass channel with a manually cleaned bar rake, and two equalization basins. Secondary treatment will consist of an Aero-Mod extended aeration activated sludge process made up of selector tanks, aeration tanks, and clarifiers. The recycled water will be used for irrigation within the Harmony Grove Village development as well as other areas within the Rincon Del Diablo MWD service area. Project consists of 2500CYD of concrete and over 100 pieces of equipment to install. Together with subcontractors, over 100,000 ft of mechanical and electrical pipe will be installed. Harmony Grove Village development project is a master-planned ccommunity located in an unincorporated area of San Diego County between San Marcos and Escondido. The development will occupy 468 acres and include single family residential units, commercial buildings, a park, several community purpose facilities, and an equestrian area.